About Jose R. Message Jose R.
The perfect combination for nature lovers. Jose was fantastic. He had lots of information about Costa Rica. 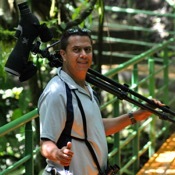 We started at Mistico hanging bridges and he knew all the spots to find things. Educating us and snapping great pictures along the way. Snakes, bats, hummingbirds, fauna...... After lunch we went to La Fortuna falls an then on to Arenal volcano as we watched the sun set after climbing for about an hour. We finished with dinner together. All 3 of us felt so fortunate to have him as our guide and you will too. book him if you can! Excellent guide, knowledgeable, very good English, good driver, well met and accommodating.